Statistical Concepts - A First Course presents the first ten chapters from An Introduction to Statistical Concepts, 4th Edition. Designed for first and lower level statistics courses, this book communicates a conceptual, intuitive understanding of statistics which does not assume extensive or recent training in mathematics and only requires a rudimentary knowledge of algebra. Covering the most basic statistical concepts, this book is designed to help readers really understand statistical concepts, in what situations they can be applied, and how to apply them to data. Specifically, the text covers basic descriptive statistics, including ways of representing data graphically, statistical measures which describe a set of data, the normal distribution and other types of standard scores, and an introduction to probability and sampling. The remainder of the text covers various inferential tests including those involving tests of means (e.g., t tests), proportions, variances, and correlations. Providing accessible and comprehensive coverage of topics suitable for an undergraduate or graduate course in statistics, this book is an invaluable resource for students undertaking an introductory course in statistics in any number of social science and behavioral science disciplines. "This edition delivers on many fronts and sets this book apart from the rest. The clear and conversational style emphasizes the applied and practical without compromising the theoretical and conceptual underpinnings. The parallel use of SPSS and R that walks the reader step-by-step through the procedures coupled with fully annotated interpretation of printouts are very appealing to both novice and more seasoned applied researchers. Rather than treating subjects like power and effect size or verification of assumptions in isolation, the authors do a fantastic job of blending them with the analyses to make the story behind the numbers more compelling and complete. The abundance of visuals and APA style write-ups all contribute to simplify and enhance the learning experience." - Devdass Sunnassee, Assistant Clinical Professor, University of North Carolina, USA. "I have relied on previous versions of this textbook to bring to life statistical concepts in my beginning and intermediate level graduate classes. I also share this valuable resource with students who ask questions when working on quantitative projects. This fourth edition brings enhanced materials, explanations, and examples to aid students in gaining basic proficiency in foundational statistical concepts. The detailed and numerous practical examples demonstrate the inner workings of basic statistical methods in the social and behavioural sciences. I look forward to sharing this enhanced edition with our graduate program" -Brian F. French, Washington State University, USA. "Combining theory and mathematical accessibility with examples in various fields of behavioral sciences, SPSS and R applications, APA style write-ups, after-chapter conceptual and practice problems for students, online pedagogical aids, this is a valuable book for introductory statistical courses in behavioral sciences. It has a broad coverage of topics, and the addition of the new chapter on mediation and moderation adds to its value as a classroom text or as a reference for applied researchers." -Feifei Ye, RAND Corporation, USA. "Anyone familiar with previous editions of Statistical Concepts from Lomax and Hahs-Vaughn recognize and appreciate the pedigagogically sound treatment of statistical methods comprising introductory and intermediate topics found in many quantitative methods graduate programs. In addition to enhancements found in the past versions such as APA-style write-ups of statistical results and the numerous screen shots depicting both annotated SPSS input commands and output; the fourth edition begins each chapter with a concrete research scenario to motivate the particular statistical method. Another new feature that will resonate with instructors and graduate students are the insightful Stop and Think boxes that offer moments to reflect and to make connections between statistical ideas, data, and the software. 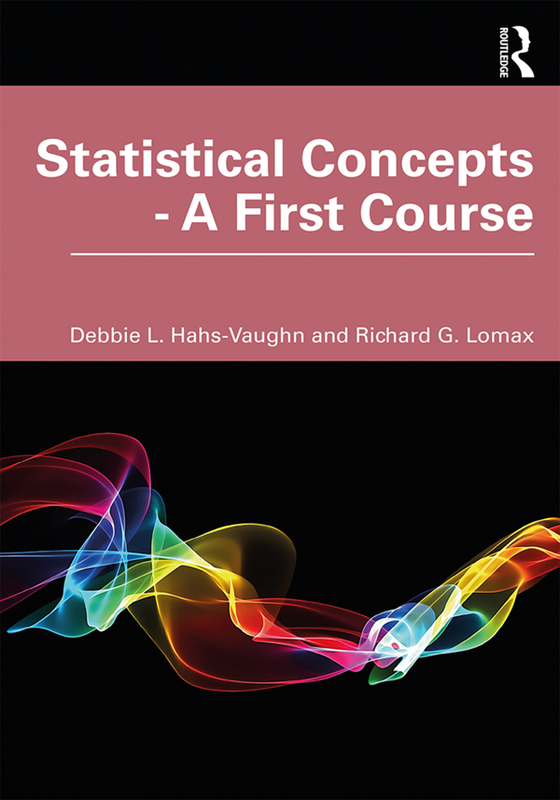 Clearly, Lomax and Hahs-Vaughn are committed to preparing the next generation of researchers and practitioners, and the latest edition of Statistical Concepts is a must-have reference for those seeking this type of comprehensive quantitative methods training." - Jeffrey R. Harring, University of Maryland, College Park, USA. "I have required this textbook for my introductory and intermediate-level students throughout multiple editions, and it has continued to get better and better. This new edition continues to emphasize the development of statistical understanding while also providing readers with valuable information on how to perform a variety of procedures using SPSS and R. The authors have added a terrific new chapter on mediation and moderation that reviews concepts and procedures that are often not a point of emphasis in traditional (textbook) coverage of multiple regression (but that are crucial for more modern data analysis). This is a book that not only is a wonderful learning resource for students, but also one they will want to keep in their personal libraries to reference when carrying out their own future research." - H. Michael Crowson, The University of Oklahoma, USA. Debbie L. Hahs-Vaughn is Professor of Methodology, Measurement, and Analysis at the University of Central Florida, US. Her research primarily relates to methodological issues when analyzing, and applied research using, complex sample data. Richard G. Lomax is Professor Emeritus of Educational and Human Ecology at the Ohio State University, US, and former Associate Dean for Research and Administration. His research primarily focuses on early literacy and statistics.